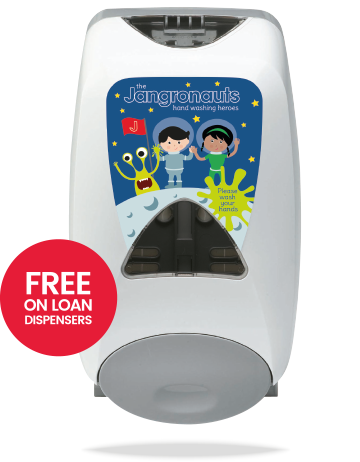 Attractive soap dispenser with a fun message, aimed at children to encourage hand washing. Safe - Factory-sealed refills reduce the threat of germs. Every new refill comes with a fresh nozzle, so there’s no long-term exposure to the germs in the washroom environment. Smart - The snap-in soap refill supports the image of washroom cleanliness, reduces maintenance time and eliminates the hassle of refilling dispensers from bulk fill bottles. Sustainable - The SANITARY SEALED Soap System is better for people and the planet. The recyclable refills use 30% less material than traditional HDPE bottles.